A splendid way to communicate love is by sharing your time and heartfelt care with others. Understanding one another is easiest when you share similar circumstances. Since I’m a caregiver to a brain injury survivor who also has epilepsy, I’ve gathered information on this month’s support groups and therapy services offered in the Salt Lake Valley for those affected by these two health issues. If you live outside of this region, or are affected by another kind of condition, I encourage you to look for support groups near you. Fill your heart with friends who understand your situation and share the love by encouraging and learning from one another. Every life that you touch is a reward for yourself. February 13, 2018 – Brain Injury Alliance Support Group for Adults, 6-8 p.m. Meets every 2nd Tuesday monthly at Sanderson Community Deaf Center, 5709 South 1500 West, SLC, UT 84123. This social group is for all caregivers and survivors. All are welcomed to share a main dish together and a craft. Bring a side dish or dessert to share if you’d like. Call Jennifer (801) 386-2195, or Beth (801) 585-5511 for more information. February 15, 2018 – IMC Caregivers and Survivors Education Groups, 7-8 p.m. Meets every 3rd Thursday monthly at IMC Cottonwood Medical Tower (TOSH Campus) 181 E. Medical Tower Drive, Murray, Utah. Caregivers meet on the 1st floor conference room and the Survivors meet on the 2nd floor conference room. Caregivers topic: Caregivers Resources – by Kathy Nelson, Utah State Representative. She will share with us resources available through the State. Survivors topic: Finding Your Voice – by Natalie Caldwell, MS, CCC-SLP. She will give ways for helping others understand your injury. February 27, 2018 – University of Utah Brain Injury Support Group 7-8 p.m. Meets every 4th Tuesday monthly at Sugarhouse Health Center, 1138 E. Wilmington Avenue, SLC, UT 84106. This month’s topic: Trails Adaptive Sports & Recreation by Tanja Kari. Come learn what options are available. Please call Ryan Pello at (801) 581-2221 for questions. February 1, 2018 – Epilepsy Group for Parents, 7:00 – 8:15 p.m. Meets every 1st Thursday of the month at the Riverton Library Auditorium, 12877 S. 1830 W.
February 8, 2018 – Epilepsy Group for All Effected by Seizures, 7:00 – 8:30 p.m. Meets every 2nd Thursday of the month. New 2018 Murray location is at the Doty Education Center – Intermountain Medical Center, 5171 S. Cottonwood St., Bldg. 6, 1st floor – CR2. EPILEPSY SUPPORT GROUP in Utah County! It begins on February 15th from 7:00 to 8:15 pm. From March on the meeting will be on the 2nd Wednesday of the month at the Provo City Library – 555 N. University Ave.
February 21, 2018 – Epilepsy Group for All Effected by Seizures, 6:30 – 8:30 p.m. Meets every 3rd Wednesday of the month at the SLC Main Library 200 E. 400 S., SLC, UT (3rd floor conference room). February 28, 2018 – Epilepsy Group for Teens, 7 – 8:30 p.m. Meets the 4th Wednesday monthly at the West Jordan Library, 8030 S. 1825 W., West Jordan, UT. There are two teachers overseeing this group. Come to enjoy an activity and meet other teens with epilepsy. Happy New Year! I hope this newsletter finds you well and satisfied with the closing of another year. A fresh start brings renewed hope for improvement. Associating with others in similar circumstances motivates progress as we learn from each other. For this reason I’ve gathered information on the upcoming month’s support groups and therapy services offered in the Salt Lake Valley. If you live outside of this region, I encourage you to look for support groups near you. Also included are links to useful and inspiring websites. If you have an activity, announcements or other information you’d like shared in this newsletter, please email Barbara@UnitingCaregivers.com. January 5, 2018 – Full Circle Yoga and Therapy, 4-5:30 p.m. located at 1719 S. Main, SLC. Brain injury survivors and caregivers are invited to attend the support group followed by an adaptive gentle Alignment Yoga practice led by Carla Anderson. Both the support group and yoga practice are free to attend. January 9, 2018 – Brain Injury Alliance Support Group for Adults, 6-8 p.m. Meets every 2nd Tuesday monthly at Sanderson Community Deaf Center, 5709 South 1500 West, SLC, UT 84123. This social group is for all caregivers and survivors. All are welcomed to share meatball subs and games together. Bring a side dish or dessert to share if you’d like. Call Jennifer (801) 386-2195, or Beth (801) 585-5511 for more information. IMC Cottonwood Medical Tower (TOSH Campus) 181 E. Medical Tower Drive, Murray, Utah. Caregivers will meet on the 1st floor conference room and the Survivors will meet on the 2nd floor conference room. Caregivers topic: Getting to Know You – A fun evening planned as we spotlight caregivers and give each one a Welcome Packet with helpful tips and inspirational thoughts plus this years meeting topic schedule. January 23, 2018 – University of Utah Brain Injury Support Group 7-8 p.m. Meets every 4th Tuesday monthly at Sugarhouse Health Center, 1138 E. Wilmington Avenue, SLC, UT 84106. This month’s topic: Trails Adaptive Sports & Recreation presented by Tanja Kari. Come learn what options are available. Please call Ryan Pello at (801) 581-2221 for questions. January 4, 2017 – Epilepsy Group for Parents, 7:00 – 8:15 p.m. Meets every 1st Thursday of the month at the Riverton Library Auditorium, 12877 S. 1830 W., Riverton, UT. January 11, 2017 – Epilepsy Group for All Effected by Seizures, 7:00 – 8:30 p.m. Meets every 2nd Thursday of the month. New location starting this month at theDoty Education Center – Intermountain Medical Center, 5171 S. Cottonwood St., Bldg. 6, 1st floor – CR2 , Murray, UT. January 17, 2017 – Epilepsy Group for All Effected by Seizures, 6:30 – 8:30 p.m. Meets every 3rd Wednesday of the month at the SLC Main Library 200 E. 400 S., SLC, UT (2nd floor conference room). January 24, 2017 – Epilepsy Group for Teens, 7 – 8:30 p.m. Meets the 4th Wednesday monthly at the West Jordan Library, 8030 S. 1825 W., West Jordan, UT. There are two teachers overseeing this group. Come to enjoy an activity and meet other teens with epilepsy. NEW EPILEPSY SUPPORT GROUP in Utah County! It begins on February 15th and will then meet on the 2nd Wednesday of the month from 7:00 to 8:15 pm, at the Provo City Library – 555 N. University Ave.
I’ll bet every woman feels she is wearing too many hats from time to time as she tries to fulfill the needs of family, friends, personal, professional, neighbors and colleagues. Today we celebrate mothers of the family and the influence women have in society. Next to my own mother who gave me the gift of life and continues to effect who I am today, stands my mother-in-law, Wanda. Her optimistic power in Mark’s life is a great blessing to me too. Besides being a creative, fun, loving and caring mother, she made a career as an Occupational Therapist (OTR). Wanda was the first OTR I’d met and I assumed she helped people find a job. It didn’t take long for Mark to set me straight. She helped people with mental illness perform activities needed in daily life by using a crafts media. Through the years after our accident, I quickly learned the importance of skilled OTs. The ability to brush his teeth, feed himself and get a shirt on became the tasks Mark had to relearn after his Traumatic Brain Injury (TBI). Since 1991, I’ve met more OTs than I can count and I appreciate each one for their help with improving Mark’s quality of life. Whenever meeting an OT for the first time, Mark proudly states, “My mother is an OT” He then shares some experiences he had as a child with her work. I’ve written, “I was raised to be a caregiver.” My upbringing helped prepare me for this challenge. Likewise, I believe Mark’s childhood prepared him to be a survivor. Two hats, Mother and Occupational Therapist, which have had the greatest impact in our lives. I asked Wanda why she chose this career and she agreed to let me publish this interview. The first thing that drew me to OT was a movie called Snake Pit. It was about a woman who was committed to an asylum and how she eventually recovered and was released. When I was picking a major in college and looking through college catalogues, OT caught my eye because it involved helping people and a lot of crafts. I learned that psychiatric hospitals had OTs and the deeper I looked into it the more interested I became. Psychiatry and the idea of helping someone improve their attention span, concentration, attention to detail, better living and socialization skills and generalization by using crafts media was what influenced me most. How long and what kind of schooling did you need before you could practice OT? I had four years in college with a major in OT and a nine month internship working with other OTs and passing the national exam, which qualified one to add the R after OT. The internships had to be in all these fields: pediatrics, general medicine, tuberculosis, orthopedics and psychiatry and you had to be over 21. I started college in 1948 and got my degree in 1952. By the time I finished internships I really liked both orthopedics and psychiatry and decided I would take either kind of job. Psychiatry was the first job that turned up so I started in 1953. At that time about the only hospitals that had psychiatric patients were institutions. Since then most hospitals of any size have a small unit for psychiatric patients. If I remember correctly, I think I worked in psychiatric settings for 22 years: small private settings, large state and territorial settings and the last 16 years at a medical teaching university. What made a good patient to work with and what made a good family member or caregiver? All patients were good to work with. We seldom even met family members because until recently, families were ashamed or afraid of mentally ill family members and seldom even acknowledged them. The patients were committed to hospitals and lived there, seldom seeing or hearing from their families. How did you feel about this separation from family? I thought family abandonment was terrible, but that’s just how it was. Some of the staff were concerned about the patients, others not so much. In hospitals where patients stayed a long time (years), they formed friendships and the hospital was like a community. Describe a typical day at work and some of the crafts you did with the patients. At Oregon Health Sciences University, the day started with rounds, then OTs led an exercise group and a crafts group before charting and lunchtime. After lunch, we led a relaxation group, then an activities group where we worked on attention span, concentration, social skills, etc. This often involved playing games of all kinds, quizzes or planning for the lunch that the patients got together to cook for everyone on the unit once a week, then more charting. Yes, we used a full variety of knives and never had a problem with them in any of the groups. We did check tools and equipment after all groups. In other settings, OTs were responsible for arranging social events, mostly dances and church services. This included everything from getting the band or minister to setting up the room. Sometimes we took patients on outings such as bowling, walks, etc. Some of the major crafts we used were: leather work (hand tooled and carved purses, belts, etc. ), weaving on pot holders frames to floor looms, ceramics (slab construction, pinch pots, molds), needlework (knitting, crochet, embroidery, sewing) and all minor crafts you can think of. There was a job cut, so Wanda retired in 1998, seven years after Mark’s TBI. From my own experience with OTs I can imagine the constructive difference she made to hundreds of patients she helped, along with the students and colleagues she influenced. I witnessed some of this when Wanda visited Mark in the rehab center as she quickly became friends with Mark’s OT The therapist was new to the field and appreciated Wanda’s experience and sought her advice at times. Since Wanda lived several hundred miles away, she mailed things for Mark to work on or sent articles with ideas to help him. To all the wonderful women in the world who benefit lives in a positive way! Therapy isn’t fun, but the progress and inspiration I get from other patients encourages me. Last week I met JR. He’s a recent amputee who is embracing his new life challenges. I told JR about Uniting Caregivers and asked him if he’d allow me to share his story. He graciously agreed to let me interview him. I took a seat in the large, open sitting room just as you enter inside Rocky Mountain Care in Riverton, Utah. This area is a popular place for the in-patients to read, do crossword puzzles or chat with visitors, so we found a quiet corner by the grand piano looking towards a fireplace which wasn’t lit due to the unseasonably warm November day. The home-like atmosphere makes this place comfortable, but I have to admit, I’m glad to be here as an out-patient. I nodded and told him it made sense to me. I asked JR what diagnosis brought him here. JR nodded in agreement.“They allow me some independence and I knew this was coming,” he said as he glanced down at his gray sock which covered his shortened leg. Later he told me the compression sock which covers the ace wrap around the newly cut leg is called a “shrinker.” It decreases swelling, which is critical for the proper fitting and use of an artificial leg. “I got an ulcer in my ankle. The open sore failed to heal even after weeks of being on a heavy duty antibiotic through an IV pic line. On week four of fighting the infection I had surgery to clean it out. Week eight they did an MRI which showed the infection had gone into the bone. On week nine my skin actually peeled when they unwrapped my leg. My toe was black. The infection had moved down into my foot and toes. That’s when the decision was made to do an amputation,” he said in a matter-of-fact way. September 1st they did the first cut on his right leg and he was scheduled for a second surgery six days later. On that sixth day he was feeling pretty good and thought he could get to the bathroom on his own. Unfortunately, he fell and broke his left hip. Instead of surgery on the amputated leg that day he had a titanium rod placed in the left femur, which was secured with two screws into the broken hip. The following day he had his second surgery on the right leg. In an eight day period of time he had three surgeries. After twenty-one days of hospitalization he was taken to the care center on a stretcher for rehab. I first met JR on Halloween. My therapist said, “You have to meet JR, he’s a great example of embracing life challenges.” She wheeled JR into the room. I had to smile as she introduced us; he was dressed like a pirate, complete with a wooden branch for a peg leg. I told him he looked great and we both laughed. I thought his jolly disposition along with his long white beard and hair made him also a good candidate for Santa Claus. He later told me about the trick-or-treaters who came that evening. One boy asked him what happened to his leg. His father seemed embarrassed and hurried him on to the next bag of treats. Another boy also asked what happened, but this time JR was given the time to respond. “I was in a sword fight and lost my leg. Boy—did that boy’s eyes get wide,” JR said with a mischievous smile. “I imagine his dad had some explaining to do later,” he chuckled. “Some parents are so mortified they turn away and rush their child away from us. This actually makes us feel more awkward. Parents don’t need to be embarrassed. We understand Mark looks and sounds different than most,” I said. JR shared his goals and timeline with me and said he should have his artificial leg on November 28th. He also has some work to do at home, especially modifying the shower because he won’t be able to stand to shower. He’s working on those arrangements as well as his rehabilitation. Thank you, JR, for sharing your story. I really appreciate your example of embracing life challenges. Best wishes to you and your family as you make the transition home. It’s been my pleasure getting to know you and I won’t forget your example along with others at Rocky Mountain Care who have made my shoulder rehabilitation more pleasant. Mark’s pneumonia seemed to be improving, but the fever persisted and the white cell count was too high. Dr. Wright felt changing his feeding tube would improve his condition. 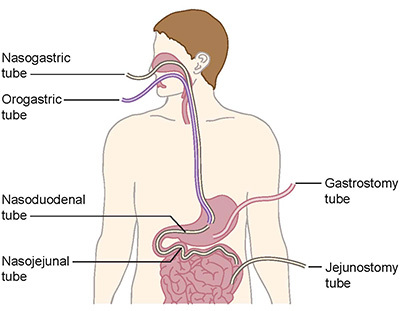 “The nasogastric (NG) tube is not meant for long term and can be a source of infection. Since we don’t know how long it will take for Mark to be capable of chewing and swallowing, I recommend it be replaced with a gastrostomy tube which allows feeding directly into the stomach,” Dr. Wright said. 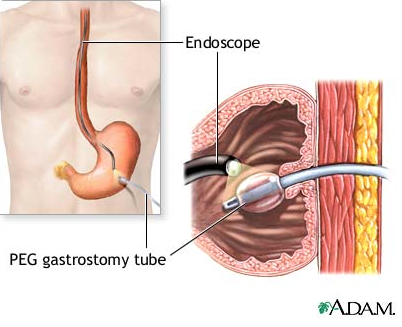 “The percutaneous endoscopic gastrostomy (PEG) procedure is relatively common under these circumstances. It’s a simple surgery, which only takes 30-45 minutes,” the doctor said. I despised making decisions for Mark. The responsibility was a heavy load that I was unprepared to carry. What would he want? I tried to connect with his spirit. Tell me Mark, what do you want me to say? Do you need the feeding tube? Should I agree to it? I knew I had to be his voice, but I wanted him to give me the answers. I felt and heard nothing. “I believe the PEG will improve Mark’s condition and lower the frequency of aspiration. He’ll tolerate it better,” the doctor encouraged. Within a few days, Dr. Wright arranged for the surgery at a nearby hospital and ordered a specialized van which could transport Mark in a reclined wheelchair. I rode in the van with Mark. He was unconscious and seemingly unaware of the drive on this beautiful, hot summer day in July. When we arrived at Cottonwood Hospital, two male aides lifted Mark’s stiff body onto a stretcher and wheeled him into an operating waiting room. I meet the surgeon for the first time just minutes before the surgery was scheduled. With a nurse at his side, the doctor explained to me the procedure details. The nurse handed me a thin, wooden clipboard with forms for me to sign, not only giving approval for the surgery, but declaring my understanding of the risks involved. The complications listed included: aspiration, oversedation, wound infection and/or bleeding. These complications I could comprehend, but an injury to the liver, bowel or spleen took me by surprise. When I read hemorrhaging and perforation, or unwanted hole in the bowel wall, which could be fatal, a big red flag shot up in my mind. Risks—wait a minute. I was only told about how common and simple this procedure was. Now I’m reading about all the unfortunate possibilities and just minutes before the surgery was scheduled. I felt trapped and wasn’t convinced Mark needed the PEG in the first place. I believed with every fiber of my being that life would get back on the normal track—the one we were familiar with. I couldn’t imagine any other way of life, but these foreign road blocks kept getting in our way. I looked at Mark, who was unaware of my turmoil. I resented being in this position. I was hoping and praying for inspiration to know what his desires were, but I felt nothing. “Oh, the chances of any of them happening are one in a thousand,” he said in a reassuring voice. “I understand, but I just don’t know how much longer he will need any feeding tube and I wasn’t told about the risks until now. I need a few minutes to process this information. I don’t want to sign the consent forms under pressure. I need to think about it, I’ll be back soon,” I said as I walked out of the room, leaving the nurse and surgeon with Mark. I hurried down the hall wanting to vanish from this situation, but not knowing where to go. I can’t believe I just walked out. I don’t want to make one more decision about Mark’s healthcare, but I’m expected to. I wasn’t getting an answer from Mark on what I should do, so I knew my best option was to find a secluded place to pray. I spotted a women’s bathroom, went inside and locked the stall door. Lord, I’m under pressure to sign for this procedure. I believe you know all from the beginning to the end. Please tell me—should I sign for Mark to have the surgery? Does he really need it? Feeling awkward and anxious about this strange place for such an important prayer and my desperate need for inspiration, I was quickly overcome with a calming sensation. Yes, he needs the surgery. Fear not, everything will be alright., I am with thee. Thank you for your insight and reassurance. I walked back to the room with confidence in my decision and the surgeon and nurse were relieved when I told them I was ready to sign the forms. The nurse handed me the clipboard and after my signatures, they rushed off to the operating room. “Well, he definitely doesn’t have one. It’s more like abs of steel,” the doctor said as he shook my hand good-bye. Mark and I spent a few more hours at Cottonwood Hospital in a recovery room and by early evening the van came and drove us back to Western Rehab. The dreaded G-tube was in place and all went well. Mark survived his third operation and I looked forward to telling him that the surgeon confirmed his abs were made of steel. If it’s my friend, then why do I feel like I’m always in a battle with it? I just don’t have enough of it to do all I’d like to do. You may be thinking, well, we all have the same amount of time! This is partially true. There is sixty seconds to every minute, sixty minutes to every hour, and twenty-four hours to every day. However, none of us knows how many years, days or hours we have in a life-time, which makes it different for each one of us. In my youth I never thought about it . . . I was invincible and too busy planning all the things I’d achieve in a lifetime, like how many children and grandchildren I’d have, all the wonderful vacation spots I’d see, and all that I’d accomplish in my career. At age thirty-two I was in a car accident that postpone my plans. The desire to obtain has not changed, but in a single second my direction in life took a dramatic turn. I guess I haven’t fully made peace with the change because the older I get the louder I hear the click of the clock, and see that time is rapidly passing. It seems with age, the disappointment of unfulfilled expectation grows, along with the realization that some things may not be accomplished in this life. Since the car accident, often, when Mark is asked how things are going, he’ll say, “slow, but sure . . . but, sure slow.” This statement is right on. Every ability Mark has comes slowly, much too slowly for me and for him. However, he steadily works every day for improvement and has done so for the past twenty-two years. He struggles to do things the rest of us do without thought or effort like eating, drinking; brushing his teeth, combing his hair; typing or writing; propelling a wheelchair; balancing on the edge of the bed, or rolling over in bed. He has to concentrate and work hard at moving his arms, legs and feet. In other words, what most of us do without thought or effort, Mark works at and it becomes meaningful. Speaking also takes a lot of effort for Mark. Consequently, he chooses his words carefully and says a lot with just a few words. He thinks before he speaks. A trait I’m trying to cultivate. Because Mark’s progression is slow, his destination is sure. He knows exactly what he’s working towards and he has a plan how to get there. He feels enormous amounts of joy and fulfillment when he reaches his goals. The time and effort it takes makes his abilities so impressive. Mark is teaching me that when things come slowly they mean more. I’ve been pondering this statement and have come to the conclusion that this is one reason why Mark is at peace with himself. He understands that time is on his side; he’s not in a race against anyone else. Therefore, he is the most positive person I know. One day I asked Mark if he had an age goal he hoped to reach. He answered, “just as long as it takes,” another profound statement. Mark inspires me and I know he is right. The amount of time we have isn’t what matters. It’s the striving to accomplish, grow, and improve that counts. Mark’s patience teaches me that it doesn’t matter if it comes slow, as long as it’s sure . . . and some times, it sure seems slow! I love being married to such a wise man.